This month’s featured small business loan recipients are Josie Overmyer and Nicholas Naioti. Their new business, The Bookhouse, is a tea house and cocktail lounge located on the south side of the square in Fairfield. 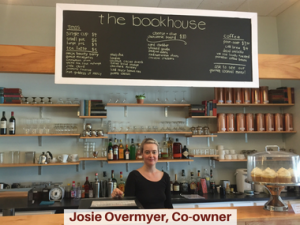 The Bookhouse opened its doors for the first time this month, and its gourmet drinks and freshly renovated space will leave you feeling relaxed and refreshed anew! “We wanted our town to have a comfortable and beautiful atmosphere to relax in,” says Josie, and they have accomplished just that. The simple, open and elegant decor lends itself to more of a lounge than cafe feel. In addition to their extensive collection of organic loose leaf teas, their eclectic menu also features a variety of classic and artisan cocktails and mocktails, pourover coffee, and fine wines. Feeling a bit peckish? They have you covered there as well, with fresh-baked cupcakes, brownies, cookies and other treats to try. Josie and Nicholas learned about Pathfinders’ small business loan program through word of mouth and put the funds from their loan toward their start-up costs. Both Nicholas and Josie have owned and operated their own business before and they bring that experience with them into this new venture. The Bookhouse is open during the day Tuesday- Sunday from 10 to 4, and in evenings on Thursday, Friday and Saturday as well. Stop by and try something new! For more information, check out The Bookhouse on Facebook.